Hey guys!! I am so excited to share with you swatches and nail art using a new collection from For Your Nail Only, the Cupid Collection. I was honoured when Sharon from FYNO asked if I could swatch her collection...I was like, hell yes I can! 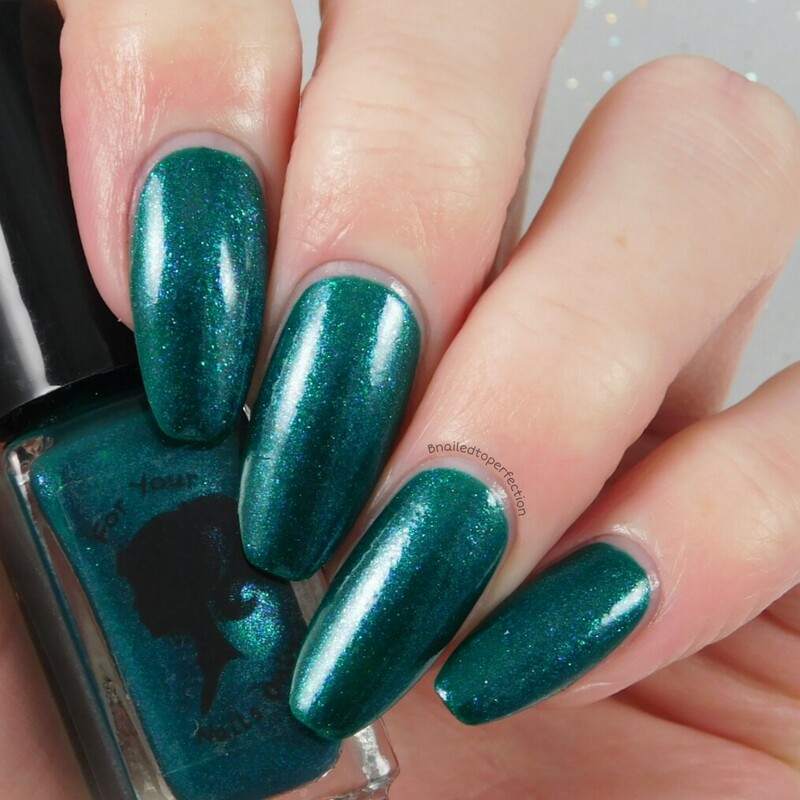 I have lusted over her polishes for a while and just before Christmas I finally placed an order. Her polishes are wonderful and this collection did not disappoint. All swatches have no top coat applied. 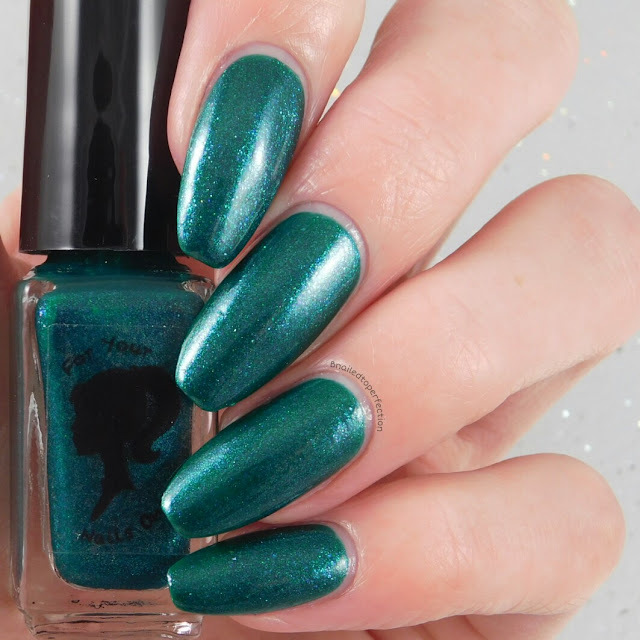 First up is Lust, an emerald green polish with tiny shimmery flakies that shift from blue to violet. Great to apply and I loved that it had a slight metallic-ish finish due to the shimmery flakies. Two coats for this swatch. 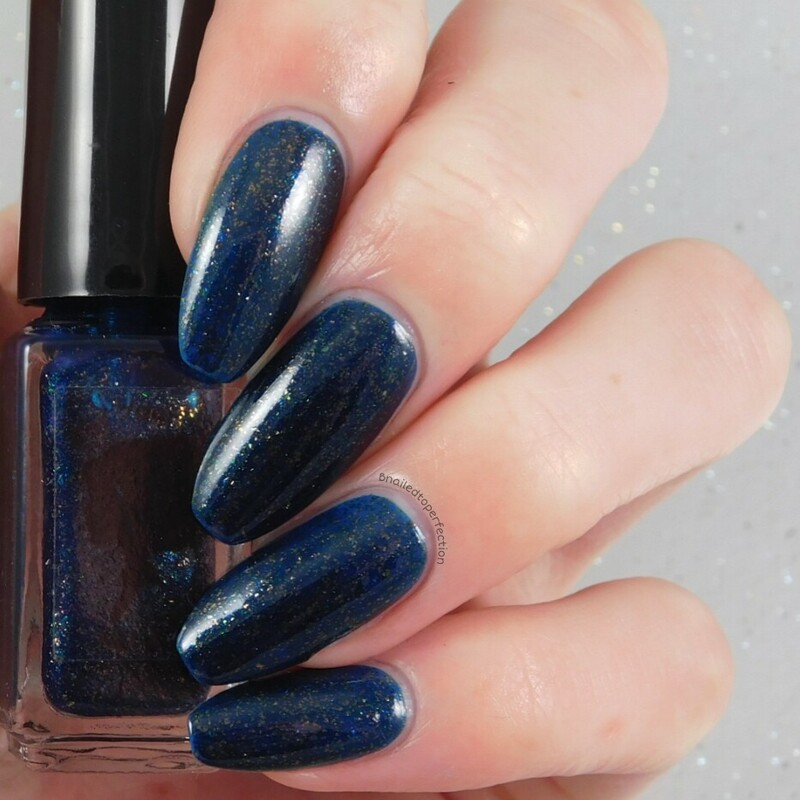 This one is a surprise polish, it's a thermal! 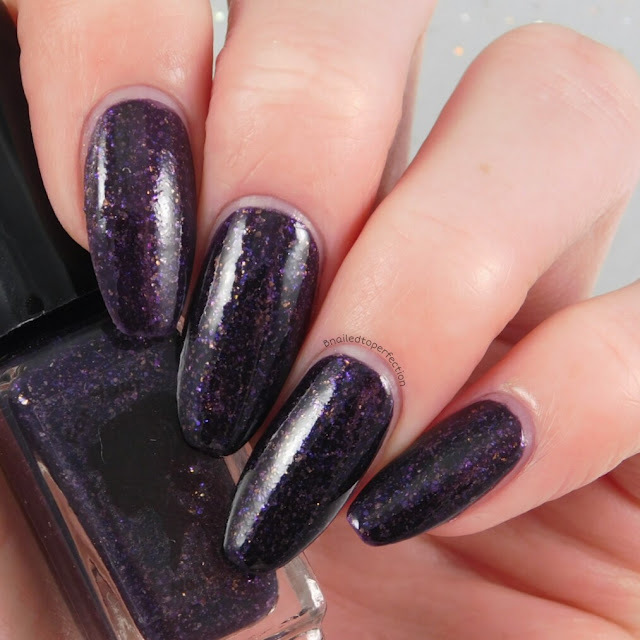 Desire is a very dark purple almost black in it's cold state and a lovely light purple when warm. It's also packed full of gold and violet sparkly flakies. Two coats for this swatch. Here's the polish in it's warm state. It's still dark on my free edge as that part of the nail doesn't touch my skin so doesn't stay warm. 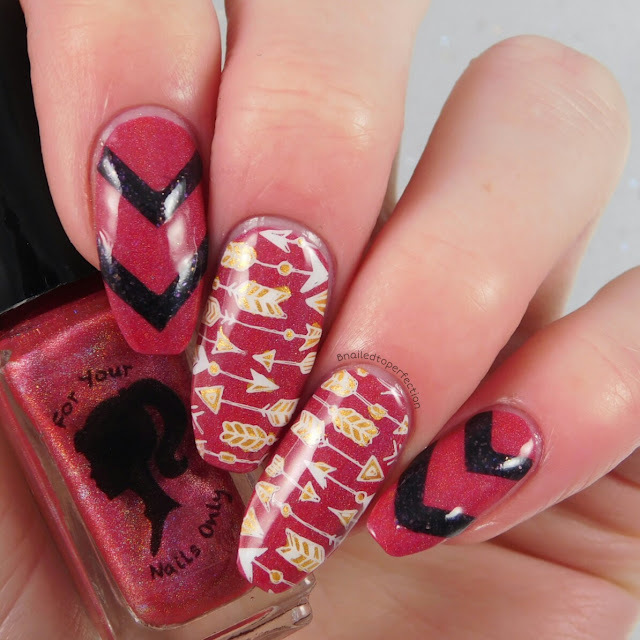 I love thermals on long nails! This is possibly my fav from this collection. 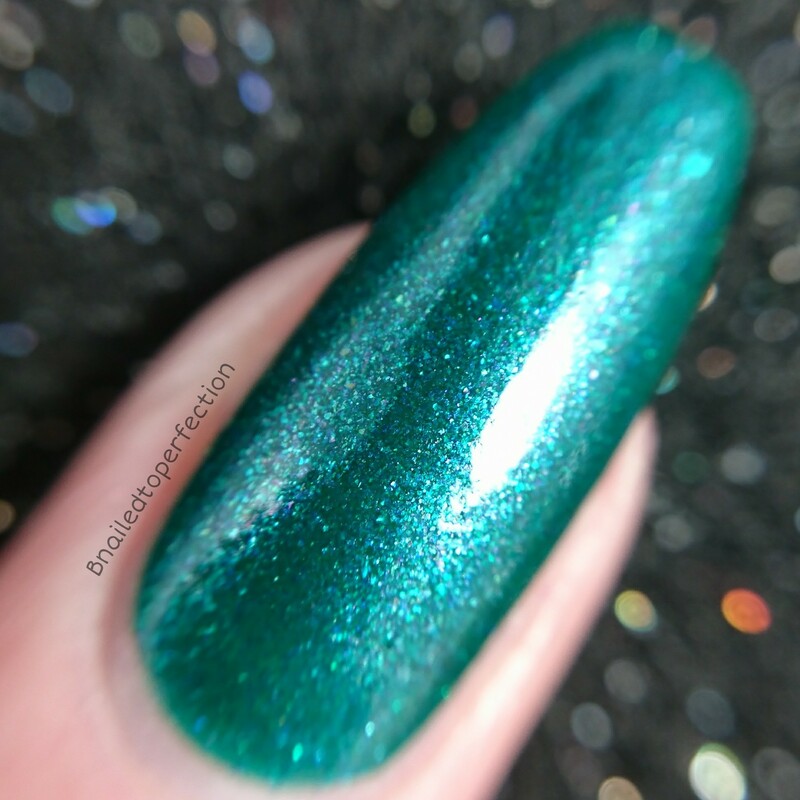 True Love is a truly stunning raspberry linear holo. It is so pretty and you can even see the holo in my light tent! Two coats for this swatch. Just look at that holo! Lasty we have Midnight Kisses. 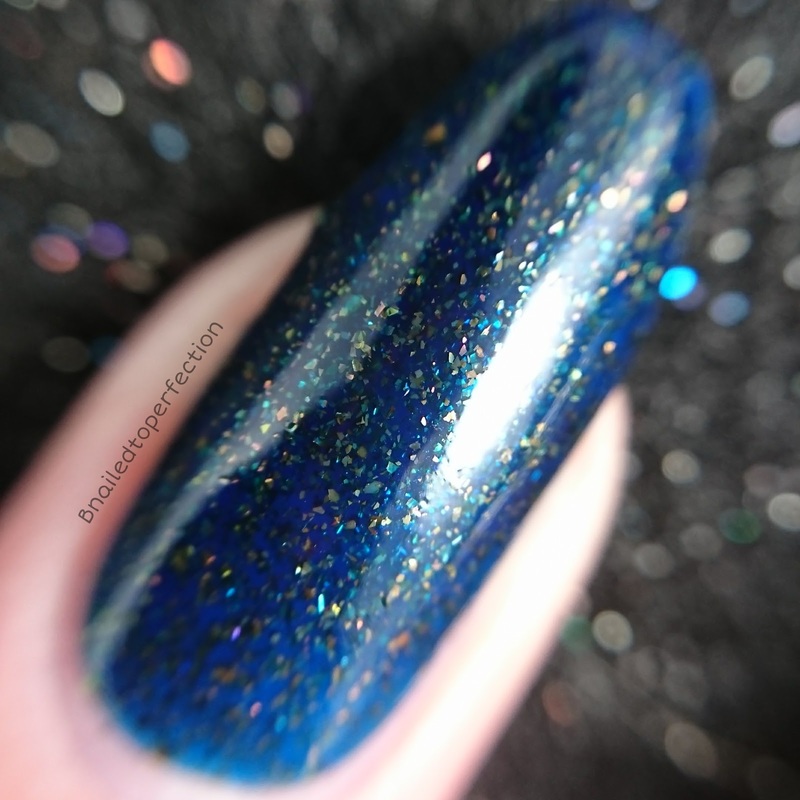 This is a gorgeous deep navy jelly with a slight green shimmer, which you can see more on the macro. It's also packed with orange/gold sparkly flakies. Now for some nail art!! 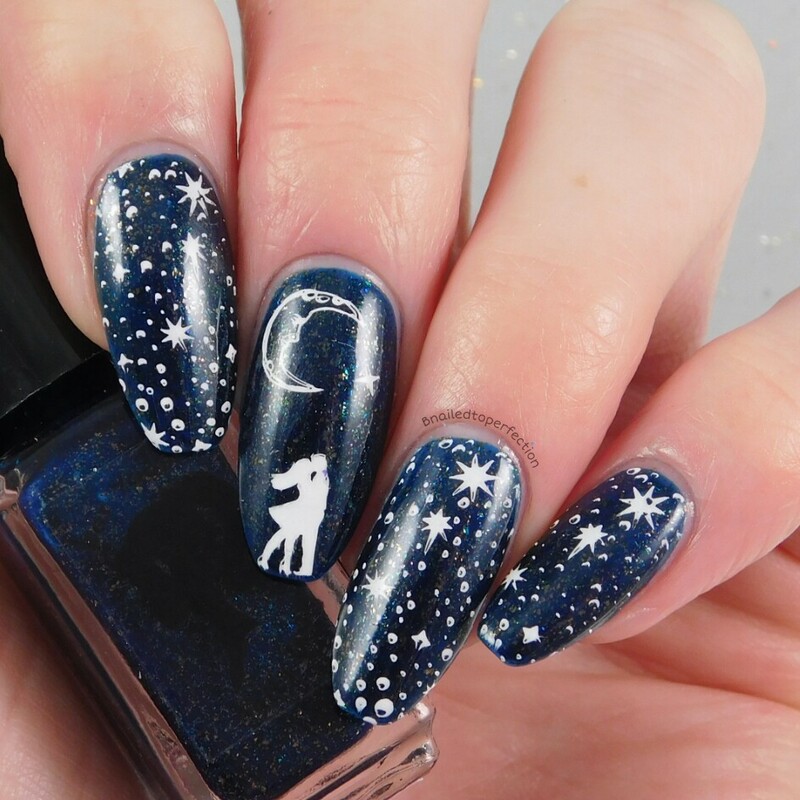 For Midnight Kisses I had the scene in my head of a couple kissing under the moon and stars...so that's exactly what I stamped! The couple is from Uber Chic Paris in Love and the star and moon are from the blogger collab plate by Bundle Monster and Kelli Marissa. Stamping polish is Colour Alike Kind of White. 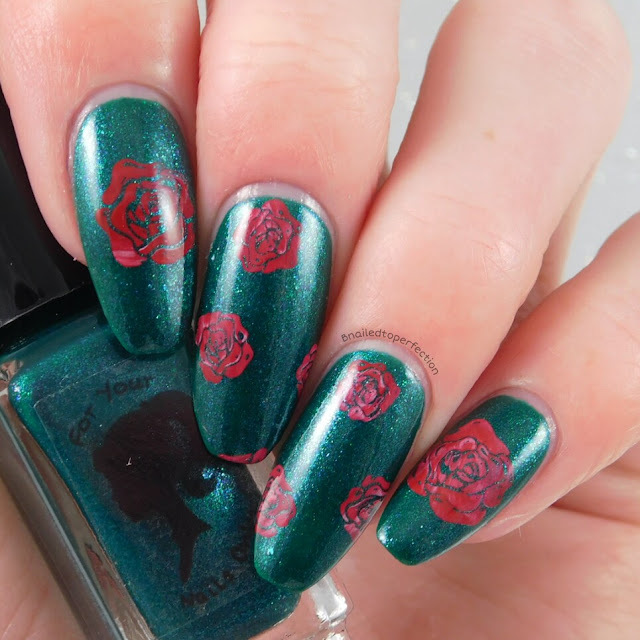 Lust had me thinking of roses and ivy so I stamped some random roses over it from Uber Chic 13-01. I blended Colour Alike Red Dragon and Drunk Pink Tank from Hit The Bottle together to get the colour of the roses I wanted. The Cupid Collection is lovely and it's nice that the colours aren't typical of a love collection. 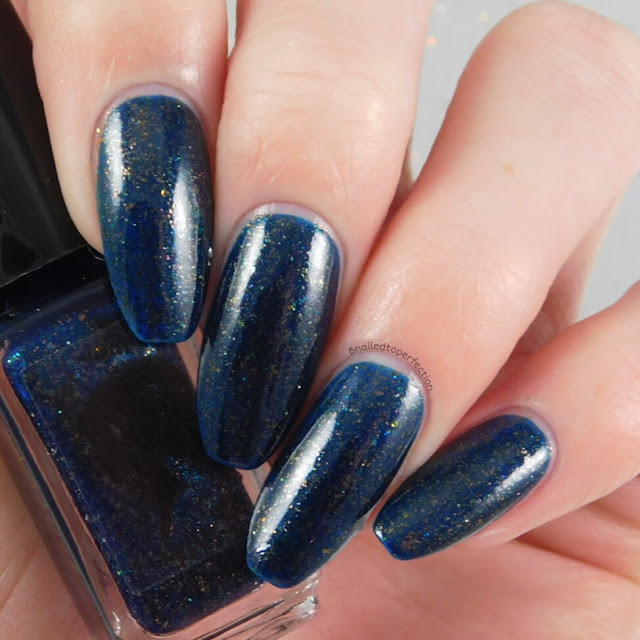 You can buy it for £15.00 or individually for £3.75, however due to the linear holo in True Love, that shade is £4.25. 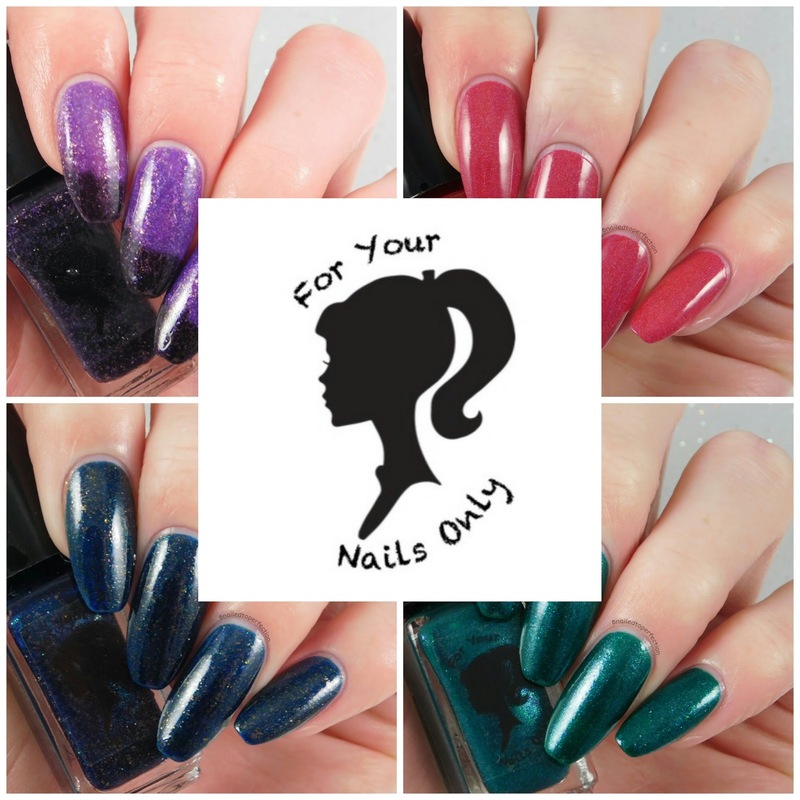 This collection will be available from 5pm on the 3rd of February along with lots of out of stock polishes...but be quick, she sells out very fast! Which one will you be grabbing? !